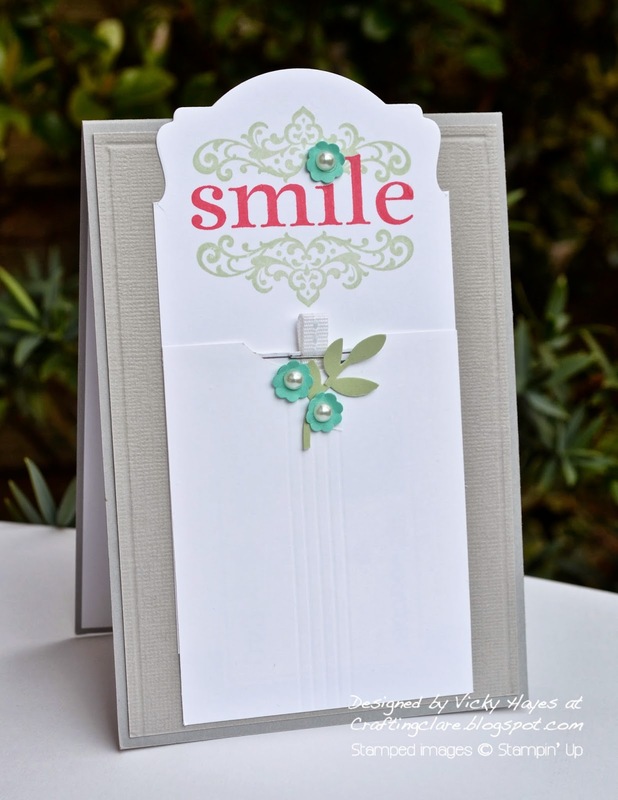 Stampin' Up ideas and supplies from Vicky at Crafting Clare's Paper Moments: Gifts for a Happy Day! Gifts for a Happy Day! I am totally in love with Smoky Slate as a base! You'd think it would be quite wintery but it is the perfect partner to all this year's gorgeous spring pastels. This is such a useful box to have in your repertoire. I used mine for handmade chocolates from our local chocolatier - hence this wonderful sentiment from Happy Day - but it's the right size for chunky jewellery, a fine scarf or perhaps a collection of nail varnishes... Mmm, yes please, if any of my relatives are reading this! Here's the coordinating card. I ran the Deco Label framelit only halfway through the Big Shot before reversing it out, which made this fabulous shaped top panel. The Happy Day swirl was stamped into the shape again but I added the Smile sentiment this time, dotted with a sweet, pearl-centred punched flower. ... it's a Stampin' Up shopping spree with me!!! Do you know someone who would smile and smile if they received one of these gift vouchers? Well, just send me an email to let me know and I can organise one for you to give them in any amount you choose. I always make a pretty voucher holder to present them in at no extra charge too - now that's what I call the perfect gift! It's still raining and raining. Still, it can't be all bad - my daughter told me that her boyfriend's baby sister likes going out in it as it gives her the perfect opportunity to carry her 'rainbrella'! Two lovely makes Vicky love the idea of the gift voucher card...thanks for the tutorial.. This box is absolutely adorable as are all your creation. You know I love your style! I didn't know you did video's as well, but they are brilliant. I agree the "smoky slate" is just beautiful and elegant too, love your box and card. What a sweet project! I have this stamp set and had not used it! I am off to CASE you! Lovely video, Vicky! You are such a good teacher.